The Saint Pio Foundation is a premier national charitable organization that promotes awareness of Saint Pio and his mission by working with institutions and ndividuals who share the same vision to serve “those in need of relief of suffering.” Funds raised by the Saint Pio Foundation are used to provide grants to American Catholic healthcare, educational, social, religious, and cultural partner organizations. More information about Saint Pio Foundation can be found at http://www.saintpiofoundation.org. Following the historic tour of the United States in 2017, relics of Saint Pio of Pietrelcina – better known as Padre Pio – will resume touring several Archdioceses and Dioceses in the United States of America from February 6th to May 11th (first part), and from September 6th to November 11th 2018 (second part). The relics will also be touring for the first time in Mexico and Canada. The 2018 tour follows last year's sensational and headline-making tour that attracted an estimated 250,000 faithful. In addition, some of the most important secular media covered this event, including FOX NEWS, NBC, The Wall Street Journal, and The New York Times, to mention just a few. The relics will be at the Cathedral of the Holy Trinity of the Diocese of New Ulm, on Sunday, October 28, 2018, from 11 a.m. to 6:30 p.m.. 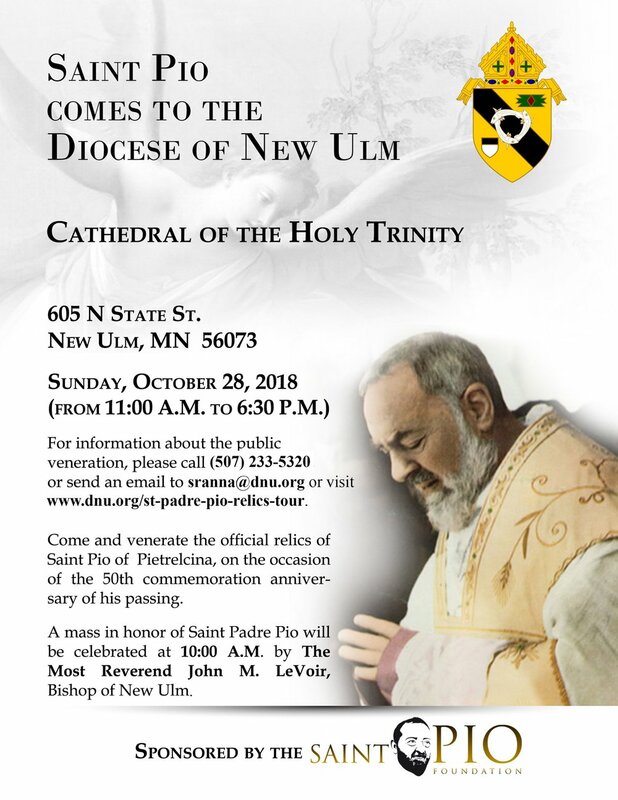 The Most Reverend John M. LeVoir, Bishop of the Diocese of New Ulm, will celebrate a Mass in honor of Saint Pio at 10 a.m.. The Saint Pio Foundation, which is sponsoring the tour on the occasion of the 50th commemoration anniversary of his passing, will sell books and items related to Padre Pio in the entryway of the Cathedral.